A still from the live-streamed video of Monday’s council meeting. 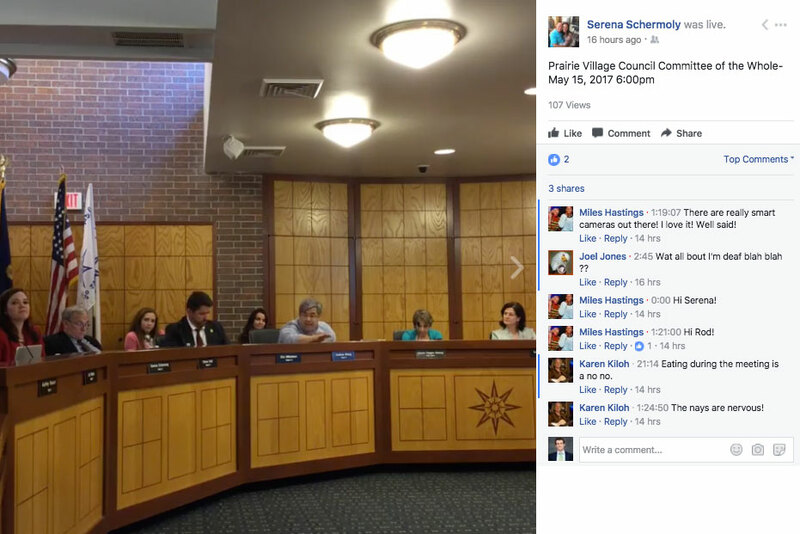 Councilwoman Serena Schermoly has taken it upon herself to organize taping of the meetings since she joined the council. Shortly after being elected to the Prairie Village governing body last spring, Ward 2’s Serena Schermoly took it upon herself to organize the recording and live-streaming of city council meeting on her Facebook page. Since last fall, as she’s enlisted family and friends help her record and transmit the proceeds from every council meeting, she’s lobbied for the city to take on the responsibility for making video of the meetings available to the public. After a vote last night, it appears Schermoly will have to wait at least a bit longer to hand over the duty to city staff. By a vote of 7 to 5, the council on Monday voted against a proposal that would have authorized the administration to spend up to $5,000 on video recording and streaming equipment and up to $3,000 for streaming and storage fees to produce video of its meetings. Proponents of the proposal — councilmembers Jori Nelson, Eric Mikkelson, Sheila Myers and Courtney McFadden joined Schermoly in voting for the measure — argued that it was a low-cost way to provide more transparency and allow people who can’t attend meetings in person to watch council proceedings when their schedules allow. But Mikkelson’s Ward 3 counterpart Andrew Wang said he’d seen almost no evidence of demand for having video recordings of the meetings made readily available. “You can’t be too transparent, but you can offer up services that nobody wants,” Wang said. Tucker Poling, a Prairie Village resident, argued later in the evening that for a cost that amounted to less than one-thousandth of a percent of the city’s annual budget, live streaming and archiving the meeting video would be an excellent way to allow people who couldn’t come to a meeting in person to be more involved in city affairs. “Even if it’s only 50 people a night watching — or 10 people a night watching — that would double the participation,” Poling said, noting that there were only around a dozen residents in attendance at Monday’s meeting. (Full disclosure: During Monday’s open forum, I also spoke in favor of the proposal for the city itself to begin live-streaming and archiving the city council meetings, and suggested that if cost were an issue, they might look to the city of Mission, which uses YouTube to transmit and host its videos as a lower cost model). Prairie Village had a tradition of broadcasting its city council meetings over a public access channel between 1976 and 1997, at which point the practice was discontinued. At present, Prairie Village produces an audio recording of its council meetings that it keeps on file until minutes from the meeting are approved. Once minutes from a meeting are approved, the recording is no longer kept on file. (The city tapes over it with a recording of the next meeting). The audio recordings are available to the public before they are deleted for a small fee, but they are not openly accessible via the city’s website or any other platform. Mikkelson used the old and new business section of the formal council meeting to make a motion for the council to consider a lower-cost option for making video of the meetings available at a later date. That motion passed 7 to 5. (And, thanks to Schermoly, you can view all of the proceedings from Monday here).